Another forex technical indicator developed by Bill Williams. This technical indicator has upward and downward histograms from a zero line. The color of the histograms is also important to find the entry and exit signals. This post explains the way of trading forex with Accelerator Oscillator technical indicator. With the Accelerator Oscillator the entry and exit signals can be found very easily. A buy signal is found, if the downward histograms make a peak and then turn into green. 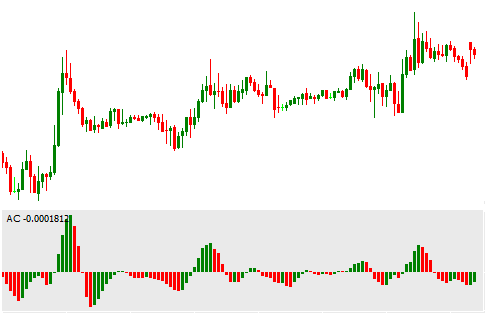 A sell signal is found, if the upward histograms make a peak and then turn into red. Zero line cross overs also emphasized. A buy order should be closed, if a sell signal is found. A sell order should be closed, if a buy signal found. These are the basic techniques of trading forex with this technical indicator. Most interesting feature of this indicator is that it can be interpreted very easily. The indicator can be applied on the charts of any time frame. This indicator can be used in scalping, short term trading, and medium term trading. This indicator is one of the most effective technical indicator for scalping. Dear Traders, you can share your trading technique with this indicator in the comment section below.